We just recently got a funny look at more of Muppets Most Wanted by way of an online promo using some amusing, fake Twitter hype. And for anyone who's already excited to see Kermit the Frog, Miss Piggy and all their Muppet pals back on the big screen with stars like Ricky Gervais and Tina Fey, there's something else to be excited about too. Attached to the Disney film will be Pixar Animation's short film Party Central, taking a cue from the Oozma Kappa fraternity from last year's Monsters University. The film took eight months to make and now we have a first look photo from the short film. Writer and director Kelsey Mann told EW, "When you first meet the Oozma Kappas, they go to their fraternity house and the first thing they say is, ‘Welcome to party central! 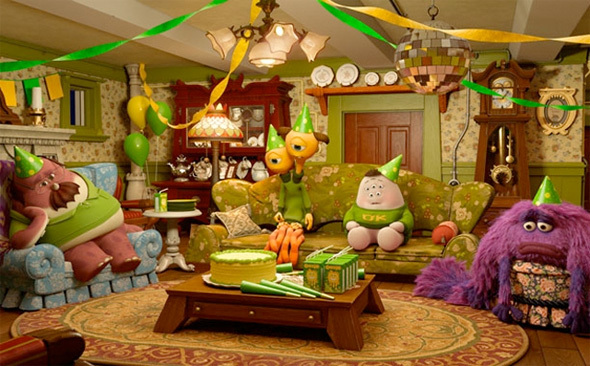 We haven’t thrown a party yet, but when we do we’ll be ready,’ I kept telling Dan [Scanlon, the director of Monsters University], ‘I really want to see their party. We have to do it in the credits or something.’ Then when the idea of doing a short came up, we were like, ‘That could be the party!’" Production on the film started towards the end of the feature film's production, and it has already screened at the D23 Expo. But you'll see it in theaters on March 21st.